Since 1969 when Mrs. Jarmilla Lang opened the shop, Lang Antique & Estate Jewelry has become a landmark in San Francisco’s Union Square shopping district. We are proud to offer the largest collection of fine vintage engagement rings and antique jewels to be found under one roof. We are also experienced buyers of beautiful estate jewelry. Whether you come in person or shop with us online, our friendly and helpful staff of gemologists, appraisers and vintage jewelry experts will be more than happy to assist you. Our dedication to preserving treasures of the past ensures that they live on for future generations, so that you may wear a little piece of history while creating your own. 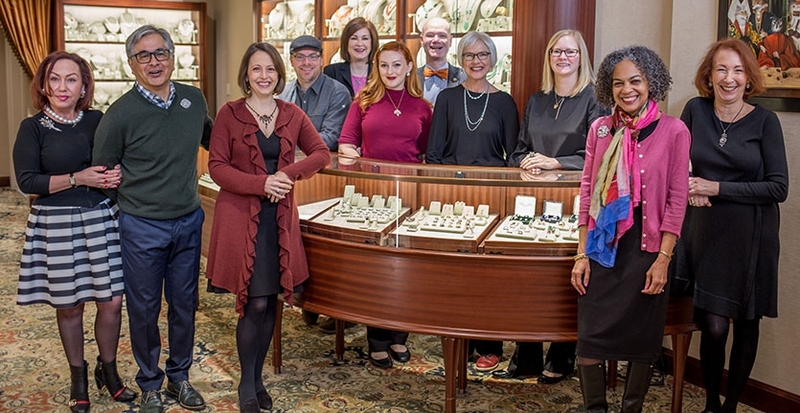 Gemologists, historians, writers, selling professionals, curators, a fine arts photographer—together, these passionate people comprise the highly credentialed and experienced staff at Lang. Whether meticulously restoring a Victorian engagement ring or taking a museum quality photograph of it, we work as a team to present each piece as beautifully as possible. We celebrate together when these unique jewels find new homes. Our vision and mission statements attest to our commitment to an environment of mutual respect. This commitment to our dedicated team is reflected in the benefits that Lang provides, which include a living wage; paid health care; paid sick and family leave; paid vacations. Our commitment is to provide our customers with an unparalleled selection, uncompromised integrity, superior service and exceptional value. The vintage jewels that we sell leave no negative impact on our planet-- physically or politically. No new mining, energy consumption, waste or dubious politics are involved in restoring and selling these classic jewels of the past. Our jewelry is kind to the environment and our in-store practices are, too. Not only does Lang utilize the latest technology in energy-saving lighting, we are active recyclers and composters. We established the Antique Jewelry University (AJU) online at www.antiquejewelryuniversity.org in 2004 for the purpose of creating a repository for all things relating to jewelry history. Appraisers, teaching facilities, jewelers and lovers of jewelry from all over the world use this informative resource.